(AP) As 21st century technology strains to become ever faster, cleaner and cheaper, an invention from more than 200 years ago keeps holding it back. It's why electric cars aren't clogging the roads and why Boeing's new ultra-efficient 787 Dreamliners aren't flying high. And chances are you have this little invention next to you right now and probably have cursed it recently: the infernal battery. Boeing is the first company to make extensive use in an airliner of technology's most advanced battery -- lithium ion. But a Jan. 7 battery fire aboard a Dreamliner in Boston, followed by a similar meltdown in Japan, led authorities around the world to ground the fleet this month, highlighting a longstanding safety problem that engineers have struggled with. In 2006 and 2007, more than 46 million cellphone batteries and 10 million laptop batteries -- all lithium ion -- were recalled because of the risk of overheating, short-circuiting and exploding. Additional safety features have been installed since then on lithium ion batteries used in consumer electronics. Lithium ion batteries, which store more energy at a higher voltage and a lighter weight than earlier types, represent the most recent big jump in battery technology. And that took place nearly a quarter of a century ago. "We need to leapfrog the engineering of making of batteries," said Lawrence Berkeley National Lab battery scientist Vince Battaglia. "We've got to find the next big thing." But none of the 10 experts who talked to The Associated Press said they know what that big thing will be yet, or when it will come. "If you crack it ... it'll change the world," said Carnegie Mellon University materials science professor Jay Whitacre. Batteries are so crucial to a greener energy future that the Obama administration has spent more than $2 billion to jump-start the advanced battery industry, including setting up what some experts say is a mini-Manhattan Project for batteries. To make the next breakthrough, researchers will have to master complex chemistry, expensive manufacturing, detailed engineering, a variety of different materials, lengthy testing, stringent safety standards and giant cost problems. It involves dealing with liquids and solids, metals and organic chemicals, and things that are in between, said Glenn Amatucci, director of the Energy Storage Research Group at Rutgers University. "We're dealing with a system that you can imagine is almost alive. It's almost breathing," Amatucci said. "Trying to understand what's happening within these batteries is incredibly complex." One reason the battery is the slowpoke of the high-tech highway is that it has conflicting functions. Its primary job is to store energy. But it's also supposed to discharge power, lots of it, quickly. Those two jobs are at odds with each other. "If you want high storage, you can't get high power," said M. Stanley Whittingham, director of the Northeast Center for Chemical Energy Storage. "People are expecting more than what's possible." On the commercial market, lithium ion batteries are generally ones small enough to fit into cellphones. But to power bigger items -- from a Prius to a 787 -- they get grouped together, increasing the juice they store and provide. That also increases the safety risk, experts say. The lithium ion battery that caught fire in a Boeing 787 weighed 63 pounds and was 19 inches long. "You can't get around the fundamental thing is that lithium ion batteries are stuffed full of flammable liquid," Whitacre said. Even one-in-a-million problems with lithium ion batteries can result in many fires because there are billions of them in use now, with dozens sometimes stacked together in a single device. Experts say lithium ion batteries are more dangerous because their electrolyte, the liquid that allows ions to move between electrodes in the battery, is more flammable than the substance in older type batteries. Those older types include the lead-acid batteries in most cars and the nickel cadmium batteries that are often in video equipment and power tools. Still, MIT materials science and engineering professor Gerbrand Ceder and others said the safety problems can be fixed. Change doesn't come often in the battery field. "The big advances in battery technology happen rarely. It's been more than 200 years and we have maybe five different successful rechargeable batteries," said George Blomgren, a former senior technology researcher at Eveready and now a private battery consultant. "It's frustrating." Alessandro Volta -- for whom the volt is named -- invented the first useful battery in 1800. That was long before other breakthrough inventions like the internal combustion engine, telephone, car, airplane, transistor, computer and Internet. But all of those developments have seemed to evolve faster than the simple battery. 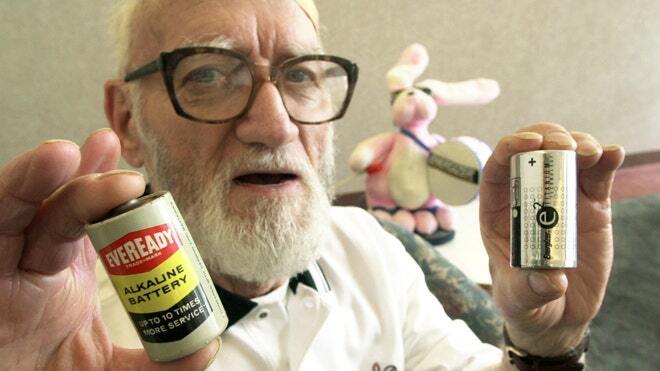 The lead-acid car battery "has been around for 150 years more or less," Whitacre said. "This is a remarkable testament to first how robust that chemistry is and how difficult change is." Battery experts are split over what's next. Some think the lithium ion battery can be tinkered with to get major efficiency and storage improvements. Amatucci said he thinks we can get two to three times more energy out of future lithium ion batteries, while others said minor chemical changes can do even more. But just as many engineers say the lithium ion battery has run its course. "With the materials in the current lithium ion battery, we are definitely plateaued," Blomgren said. "We're waiting for something to come along that really does the job." There are all sorts of new type batteries being worked on: lithium-air, lithium-sulfur, magnesium, sodium-ion. "Right now it's a horse race," Blomgren said. "There's deficiencies in every technology that's out there. Each one of them requires a major solution." One of the nation's best hopes for a breakthrough, said Battaglia, is John Goodenough, the man responsible for the 1979 breakthrough that led the first commercial lithium ion battery in 1991. He will receive the National Medal of Science at the White House next month. "I'm working on it," Goodenough, an engineering professor at the University of Texas at Austin, said Tuesday. "I'm optimistic in a sense that I'm willing to keep working on it. I think we can do some interesting things." NiCAD Nickel Cadmium Battery - What Happened!